CHIMNEY ROCK, N.C. (March 23, 2016): Chimney Rock at Chimney Rock State Park will join NC State Parks in celebrating their centennial this year. North Carolina launched its state parks adventure in 1916, responding to citizens who wanted to preserve Mount Mitchell’s majestic forest. Upon North Carolina’s purchase of 534 rugged acres, Mount Mitchell became one of the nation’s first state parks. The system has since grown to nearly 230,000 acres of the state’s most precious landscape visited by more than 17 million people each year. 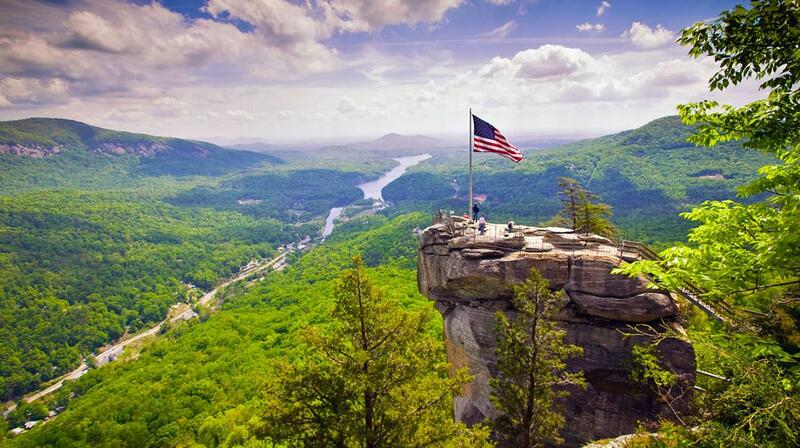 The 2016 centennial will be showcased at Chimney Rock State Park with happenings planned throughout the year, including a special flag raising ceremony atop Chimney Rock on the morning of July 4th. The United States flag will be raised, followed by the NC State flag; the NC State flag will be retired afterward. Chimney Rock’s event is just one of dozens of celebrations planned across the state, according to the N.C. Division of Parks and Recreation. Each of 41 state park units will hold a family-friendly event during the year ranging from special hikes and paddling adventures to festivals, concerts, reenactments and heritage day celebrations. There are also opportunities throughout the year to volunteer in state parks, making a difference for future generations. To view the complete list of the upcoming centennial events visit N.C. State Park website. Chimney Rock also joins nearby Pisgah National Forest and the National Parks Service in celebrating their centennials this year. Visitors to any state or national park can share their experiences via story, photos, videos or other mediums at the National Parks Service Find Your Park website. Have the time of your life in Lake Lure & the Blue Ridge Foothills, the famous film site of “Dirty Dancing.” Here, retreat to a destination where simple pleasures outshine the digital-age spectacles – a place where Main Streets reign over mega malls; where nature delivers the best adventures; and where history lives boldly and visibly in architecture, story, song and spirit. Experience these journeys and more when you visit Rutherford County located in the majestic Blue Ridge Foothills of Western North Carolina. Home to Lake Lure, Chimney Rock, Rutherfordton, Spindale, Forest City and Bostic, there is a world waiting for you to explore, enjoy and love. More info, visit www.RutherfordTourism.com or call 800-849-5998.